In addition to completing the shoring, the HCM Group offers excavation services in Eastern Canada on projects that may involve limited or tight access and where there are complex excavation procedures. On projects where shoring and excavation activities are intricate to each other, there are often advantages of obtaining a single source of responsibility. HCM has found this to be a successful approach to challenging indoor underpinning and shoring projects. One example was the Mars B project, a 3 million dollar combined contract for the HCM Group, which involved zero clearance shotcrete walls on historical facades that had special excavation and demolition needs. 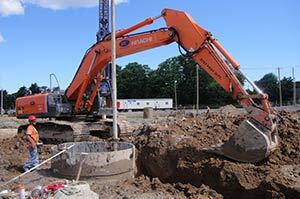 Contact the HCM Group for any difficult excavation or shoring challenges. For these unique projects, the HCM Group retains and maintains a modern fleet of equipment including excavators, loaders, bobcats and mini excavators.